A multi split air conditioning system, which is supplied with one outdoor compressor, as well as three 9,000 BTU (2.7kW) indoor units. Also included is a wall bracket for the outdoor compressor. 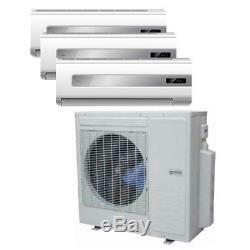 These multi split air conditioning systems are capable of running a maximum of 36,000 BTU in total. This multi split air conditioning system is pre-gassed up to 6 metres in total, for each of the 3 pipe runs to each indoor units. This system is supplied with 4 metres of pipe for each of the 3 indoor units, that are supplied; which means that there is enough gas already in the system to cope with the pipe work that is supplied as standard. Voltage: 220 - 240v (50 Hz). Cooling Capacity: 36000 BTU (10.5kW). Heating Capacity: 42000 BTU (12.3kW). Noise Level: 63 dB(A). Cooling capacity: 11000 BTU (3.2kw) (3 of these indoor units supplied in total). Cooling current input: 4.4A. Heating capacity: 11000 BTU (3.4kW). Heating current input: 4.4A. Automatic restart feature after power failure. Maximum room size unit is suitable for: 16- 27 square metres. Maximum conservatory size unit is suitable for: 13 square metres. The item "36,000 BTU Multi Split Air Conditioning Unit Powered By A Toshiba Compressor" is in sale since Saturday, April 28, 2018. This item is in the category "Home, Furniture & DIY\Heating, Cooling & Air\Air Conditioning". The seller is "innovate-electrical" and is located in Romsey.